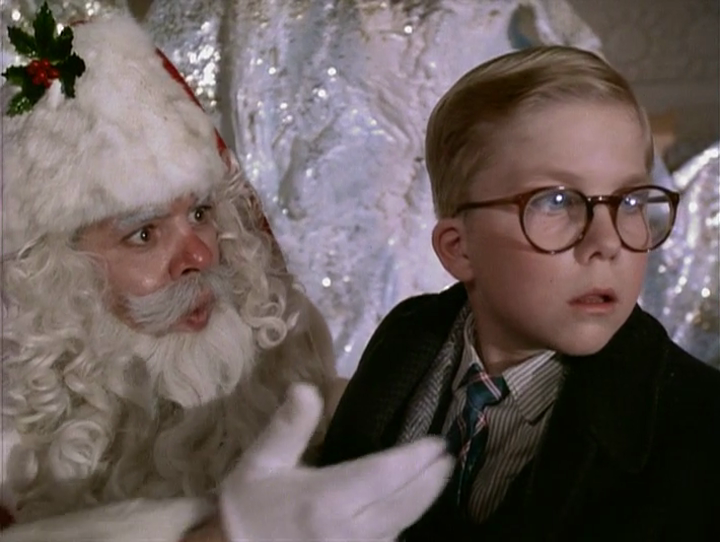 A writer (Jean Shepherd) reminisces about his most memorable Christmas, when — as a young boy (Peter Billingsley) in 1940s Indiana — he was desperate to get a Red Ryder Ranger Model Air Rifle for Christmas, and tried every tactic possible to get his parents (Melinda Dillon and Darren McGavin) to fulfill his wish. Peary writes that it’s “hard to believe the same Bob Clark who gave us Porky’s produced, directed, and co-wrote this charming little film”, based “on radio humorist Jean Shepherd‘s witty nostalgia novel, In God We Trust, All Other Pay Cash.” He notes that the “film is full of delightful, recognizable episodes”, which he spends the bulk of his review outlining: “Billingsley’s best friend gets his tongue stuck to a pole after being ‘double-dog dared’ to put it there; Billingsley decodes his secret message from radio’s Little Orphan Annie only to have it be a commercial for Ovaltine; Billingsley lets slip the ‘F’ word in front of [his] father and has his mouth washed out with soap…; Dillon coaxes his little brother (Ian Petrella) into downing dinner by getting him to imitate a pig’s disgusting habits; Billingsley and his pals repeatedly flee the red-haired school bully until one day Billingsley is so depressed for getting a C+ on his paper about his desire for a BB gun (the teacher wrote he’d get his eye shot out) that he gives the boy a whipping; McGavin wins a hideous lamp that has a plastic female leg for a base — he loves it, Dillon is aghast; and Billingsley and his brother are terrified by a kid-hating department-store Santa and his mean helpers — a scene that really hits home.” He further writes that “you’ll be touched by the warmth the members of Billingsley’s family feel for one another, and amused by their various idiosyncracies”, and he praises the “truly believable” characters and “consistently funny” script. Peary’s review is spot on: despite being written just three years after the film’s release, he accurately predicts its cult-potential, noting “there’s no reason this unique film should play only in December” — though of course, that’s exactly when most people watch it, again and again and again, as it plays in marathon mode on television throughout Christmas Eve and Christmas Day. Its cult status is somewhat legendary, with numerous websites devoted to it — including one by road-tripper fans determined to visit every site in the movie, an online merchandise store, and a non-profit foundation dedicated to preserving the neighborhood and houses where the film was shot. Clearly, this film hits a nerve for many — perhaps because of how many potent childhood milestones and concerns it covers: menacing bullies, dangerous dares, strict but loving parents, and a lack of agency over gaining one’s most coveted wish. Billingsley is perfectly cast in the lead role: he’s nerdy but no pushover, and, as the oldest child, capable of showing maturity most of the time (unlike his younger brother). This film is a treat, and I can’t imagine any film fanatic not enjoying it at least once (if not many more times). Note: In 2012, A Christmas Story was selected by the Library of Congress for preservation in the National Film Registry for being “culturally, historically, or aesthetically significant”. Yes, as an enjoyable cult favorite. Yes, of course, must-see – but, as implied above, whether they’re film fanatics or not, it’s likely that anyone who has a tv at home has probably seen this film around Christmastime. If I recall, the TNT channel would run a 24-hour marathon of it on or near Christmas Day. Being episodic in nature, it probably has something for everyone. My favorite bit is not listed above: Ralphie’s teacher is going through the pile of reports for her assignment ‘What I Want For Christmas’; she’s so appalled by the lack of imagination, bad spelling/grammar, or whatever, that she’s giving an ‘F’ to everything…until she begins reading Ralphie’s paper…which she falls madly in love with (“A+! A+! A+!”) – and Ralphie is paraded around the room as a hero. That means then that I esp. 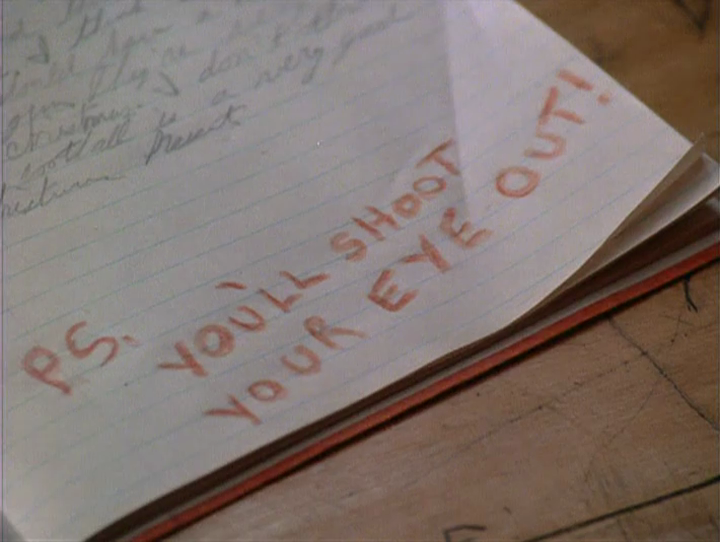 like the dream sequences that result from Ralphie’s musings on ‘things that will happen’…i.e. 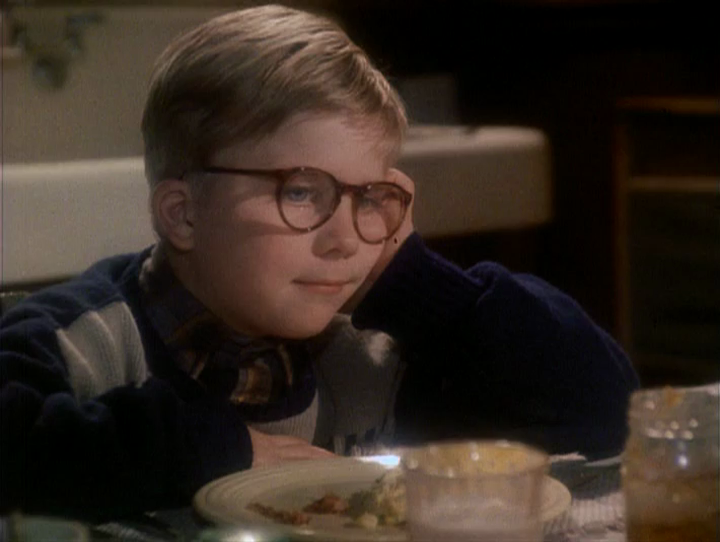 as well, with his air rifle, Ralphie is able to single-handedly protect his family from evil men who are about to descend on his house. All told, a charming film – not too sugary (at all) and not too crass or irreverent; just a nice Christmas flick…with an edge. A charming coming of age Christmas tale. 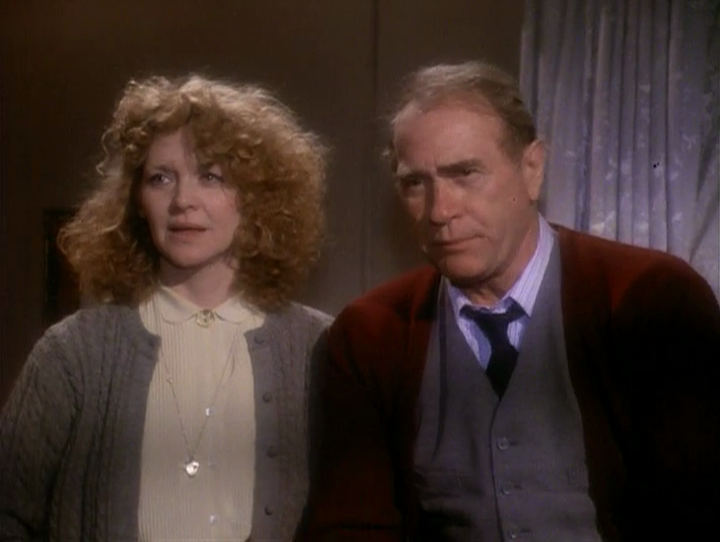 Darren McGavin is the best thing in this one. Fra-gee-lay! This movie was such a staple of my youth. We recorded a copy of this one Saturday afternoon afternoon in late ’80s December on a local UHF channel. I literally wore the VHS tape out. It doesn’t surprise me in the slightest how much of a following it has all these years later–it’s so indelible. In Cleveland, where it was shot, it has become as much a part of the local culture as the Browns’ stadium (even though wins continue to elude them) and the Rock & Roll Hall of Fame. I was there for a wedding a couple years ago in April, and had lunch in a local bar where every table was lit by a miniature leg lamp. It’s such well-constructed family entertainment with something for all ages. And the production is infused with seemingly effortless, but undoubtedly meticulous details about all the characters, which I think is where the mass appeal lies. A small cross-sampling includes: the endless longing for a toy you’re obsessed with but may never get, the youngest child is literally so overdressed for the snow by his mother that he can’t move his arms, the mother who can never put a single bite of dinner in her mouth without being interrupted by requests from everyone, the father is so cheap that they drive around on bald tires in the snow, the father is expert with the fuse box in the dark as they endure repeated brownouts because the living room outlet is overburdened with powering every electrical item there, the look of total exhaustion on the faces of parents Christmas morning. The big moments like the tongue on the flag pole or the leg lamp are iconic, but I think the care for the small details are what keeps the movie so popular. Bob Clark loves having quirky characters in his movies, and this one is layered with them. 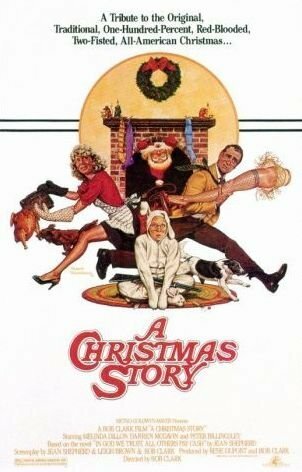 It may seem a little odd that the guy who made Black Christmas and Porky’s could also make such a wonderful family film. But there is a common thread of often unique if not always interesting characters across the different movies that makes them better than most of the peers in their respective genres.